To say that my Mother was a “pack rat” is a major understatement. It’s been years since our home at 25 Alston Ave was sold. After the sale of the house, boxes of “stuff” found their way into the homes of those interested parties. Occasionally I look at the collection of boxes that contain the oddments of our time there, and bear testimony to my Mother’s inability to throw anything out. This collection of memories has moved from several locations… attics, garages and basements that I have, at one time or another, claimed as a nest. The store room refers to a location in the basement of 25 Alston Ave, beyond my Grandmother’s make-shift butcher’s corner, up a couple of steps and nestled below the den on the first floor. As a child I could spend hours and hours looking thru a mysterious “treasure chest” of family artifacts and ancient pictures. Pictures and portraits of older friends and family that were as foreign to me as the pickelhaube that I was told my Great Uncle Barney retrieved from the killing fields of Belleau Wood. The picture that had captured my attention was taken in front of the family home in Auburn, New York. Paper clipped to the picture, some brief notes yellowed with age about the family members (I can even vaguely recognize my Mother’s distinctive cursive script). The home was on William St., around the corner from South St. As a side note, #33 South had been home to William Henry Seward. Seward, Governor of NY, then Senator, Presidential aspirant and then Secretary of State under Abraham Lincoln & Andrew Johnson. He was responsible for purchasing Alaska from Russia, but of far greater significance, at least to my Brother Paul and me, Seward was a graduate of Union College. 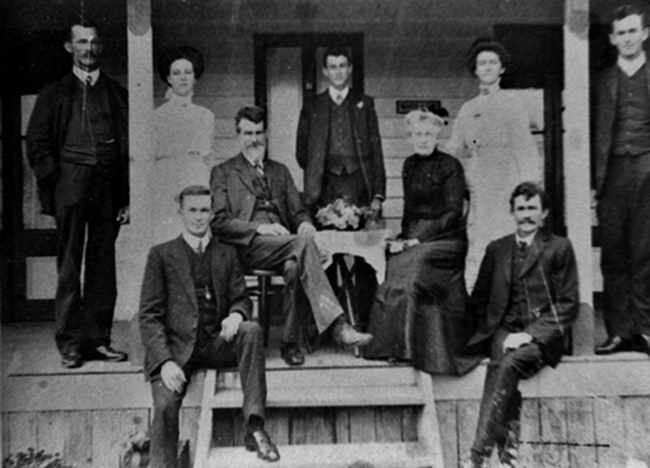 Seated on porch, the left: Martin Knightsbridge, cousin. Prizefighter. Seated on porch, the right: Fitzhugh Knightsbridge, cousin. Notary Public & barber. Standing on far left: Emile LeFong, born in Alsace, affianced to Faith Hanratty. Asst foreman of Hanratty Merchants & Dry Goods. Next to Emile: Faith Hanratty. Senior at the Auburn Normal School, and voted the Apple Queen at the Auburn Harvest Festival & Pig Roast. Seated at table, left: Judge Perkins Hanratty, Retired, Trustee of the Second Auburn Bank & Trust, Co-Founder of Auburn’s Chowder & Marching Society, Choir Master of the Genesee Congregational Church, President of Auburn YMCA, Delegate to the National Organization to Promote the Use of Carrier Pigeons, Member of the Planning & Zoning Board’s Ritual Committee, Head of the Auburn Land Trust & Owner of Hanratty Merchants & Dry Goods. Standing behind table: Perkins Hanratty, the Younger, Pigeon Keeper. Seated at table, right: Mother Hanratty, Mother of Judge Perkins Hanratty, Director of Auburn’s Tea & Sympathy Committee, Member of the Corsage Club, Past President of Auburn’s Toast of the Town, Asst Librarian of Auburn Historical Society, Member in Good Standing of the National Association of the Rose, Past President of the Auburn Quilting and Canning Group, Organized the Ladies Auxiliary of the Seward Rod & Gun Club, Member of the DAR, Founder of the Auburn League of Bereaved Women, Previous Winner of William Henry Seward Memorial Turkey Shoot & Piano instructor. Standing behind Mother Hanratty: Alice Hanratty, second wife of Judge Perkins Hanratty. Standing on far right: Ricardo Lazzarati, born in Corsica, dance teacher & friend of Alice Hanratty. My family — and it does me proud to be part of such a distinguished clan! Who would have thought it! You know… on closer inspection, maybe that’s not my Mother’s handwriting.